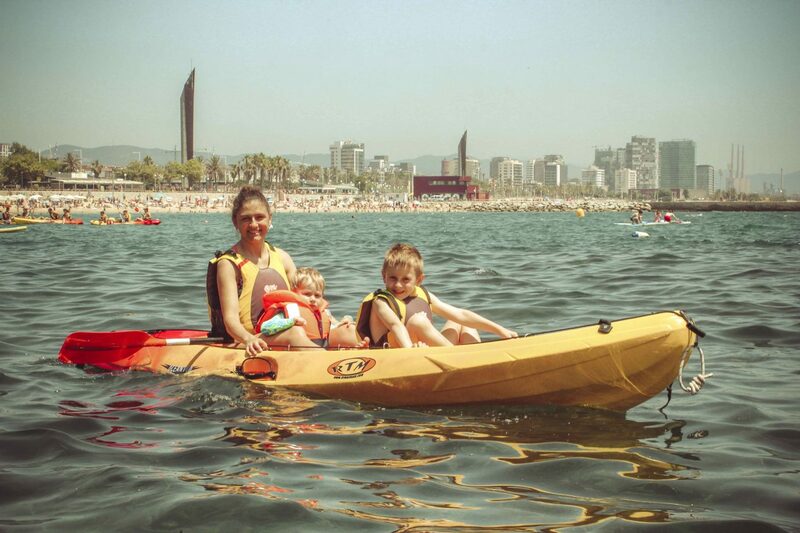 Kayak and Paddle Surf with kids. How we are preparing our kids for a full day kayak. 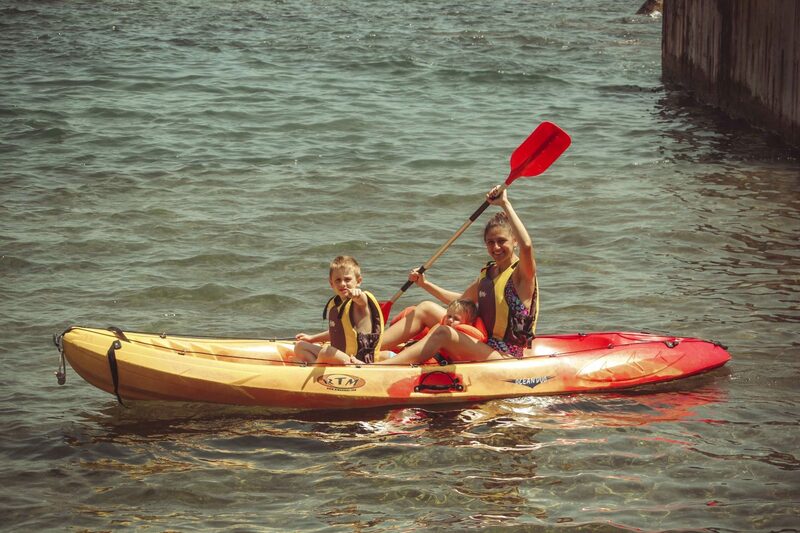 As you have already seen, this summer we went kayaking lots of times. 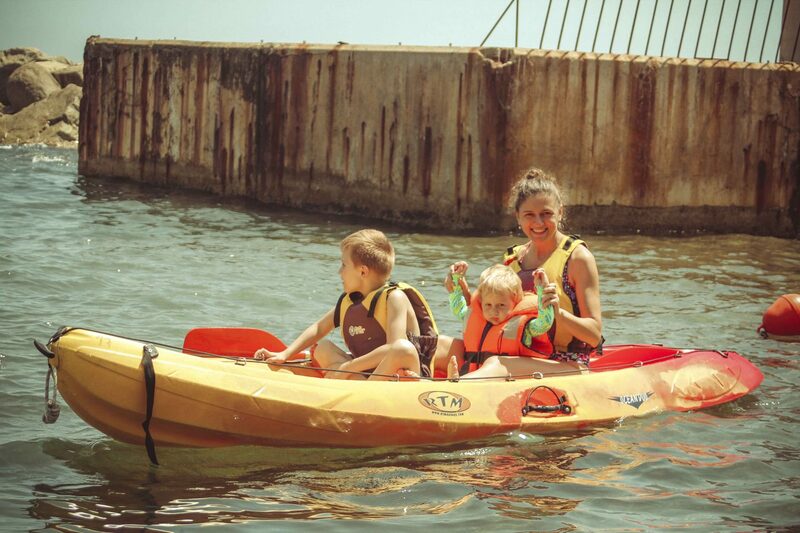 And when we go kayaking, we bring our kids along. Here to say, we didn’t went for a full day adventure, still. We always go for an hour by the sea. And it is more than enough for our kids. We started small and kept stress levels down. As our thoughts were, to get used our kids to this activity, and maybe next year we will go for a 1 day adventure, why not? On our last times when we went kayaking, daddy did paddle as well. I haven’t tried paddle surf with kids still. First times, we went when the water was calm, and with minimal current. 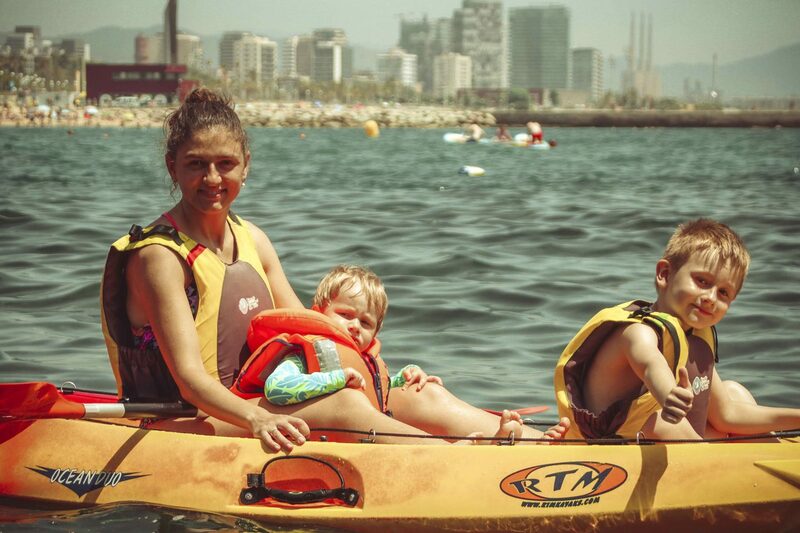 Now, we are not looking at this, as both our kids are happy to have more movements while in the kayak :). And all the experience are here in Barcelona city. 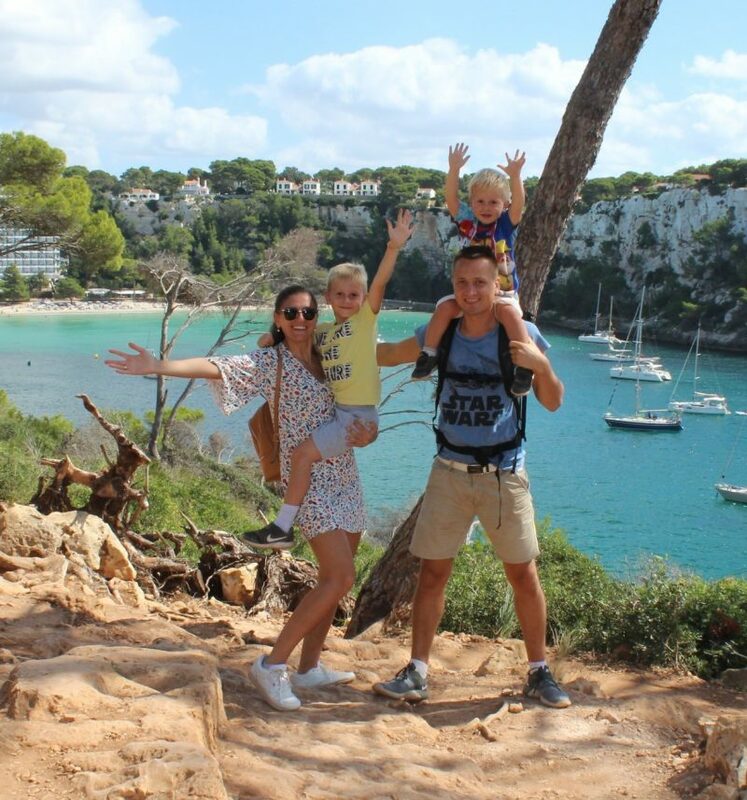 For us it is accessible, easy to go from work, and kids happy that in less than half an hour after the activity we are home. 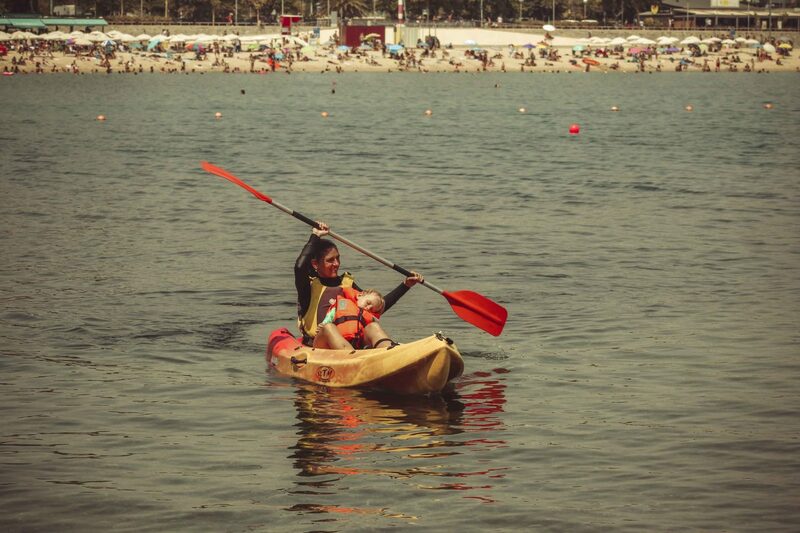 We were practicing kayaking last summer as well. Me and our old son Damian, went together many times, but he didn’t like it so much. He had no patience to stay all the hour. This summer, he likes more and more and would stay even longer than an hour. 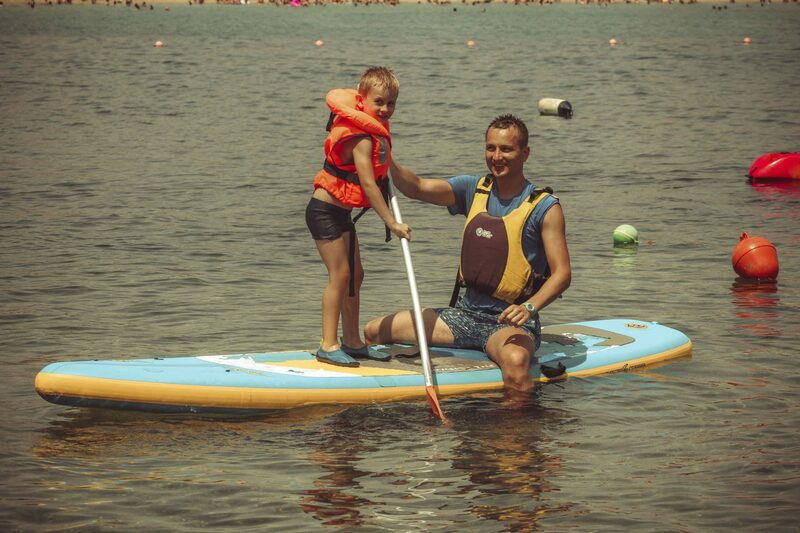 And as I said, he and daddy even tried to use paddle surf in two. Marc, our second son, began to stay in the kayak with me this year. First times he stayed 15 minutes, and then, the time was longer and longer. Now he enjoys all the hour by the kayak. Paddle surf haven’t tried with him yet. I think he will like it. We are still going with our kids on kayak or paddle. Damian is not going alone, always with somebody, me or daddy. 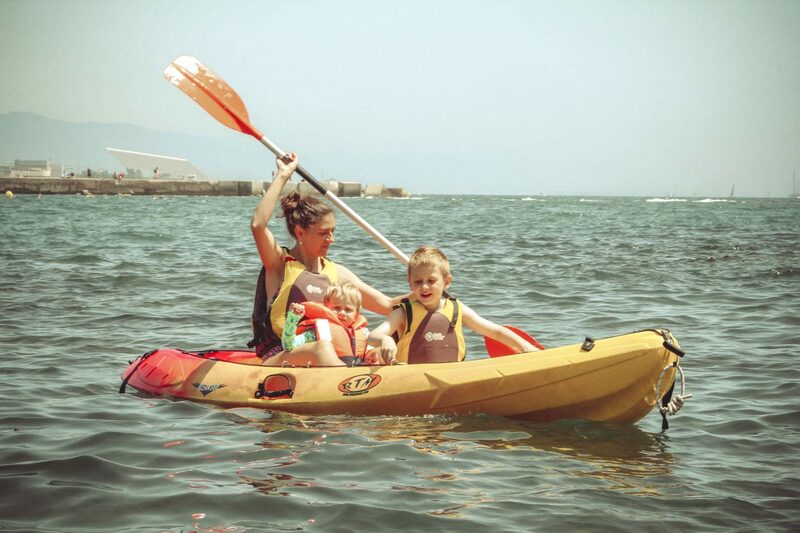 We think that for children under the age of (about) 10 years old, it’s best for them to share a tandem kayak with an adult. Children should always sit in the front seat, as the person in the backseat is responsible for steering. 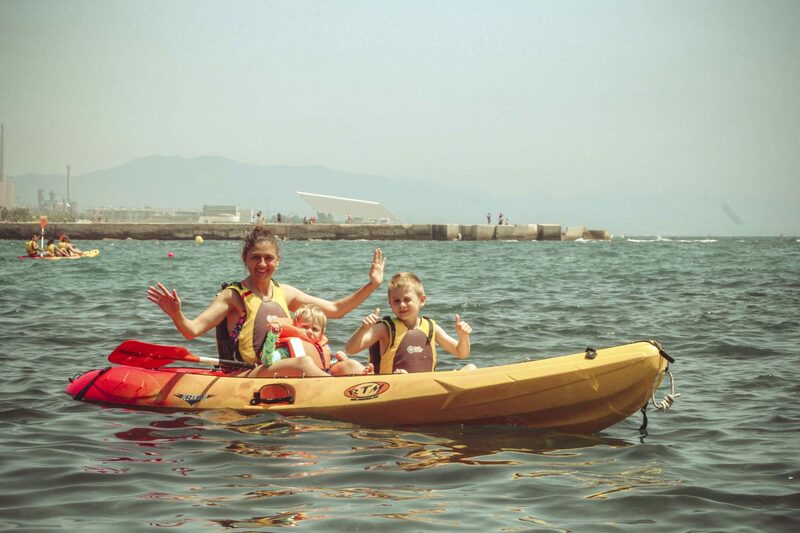 And we use standard kayaks, that are a bit wide in the diameter, and kids are properly hold. 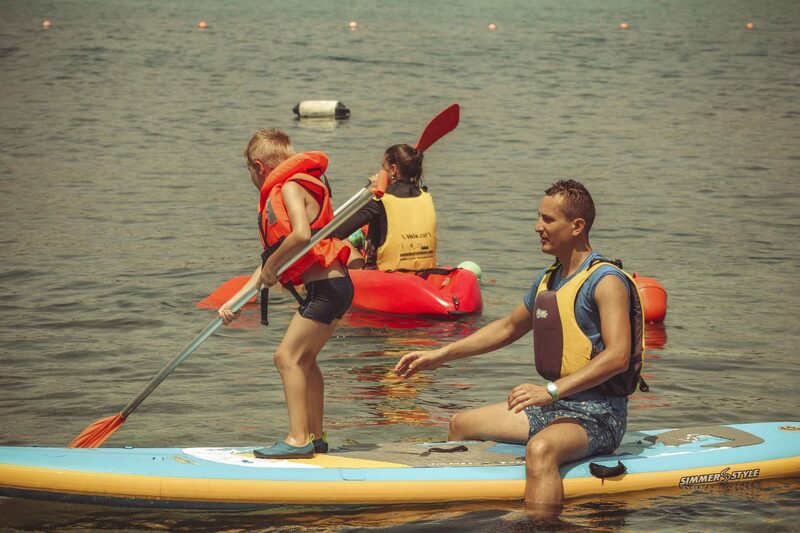 On our last classes, we even were showing to Damian instructions on how to do kayaking and paddle surf. He liked the idea, but was not so excited of doing by himself. What he likes the most is to jump into water and then get on the kayak or paddle again. What to say, pretty good exercise. Every time we go, kids have a blast. Even if they didn’t like the activity at the beginning, now they are enjoying our time together by the water. Try it with your kids as well, I am sure you will find this activity really great for all the family. Very important information to consider before doing kayak. 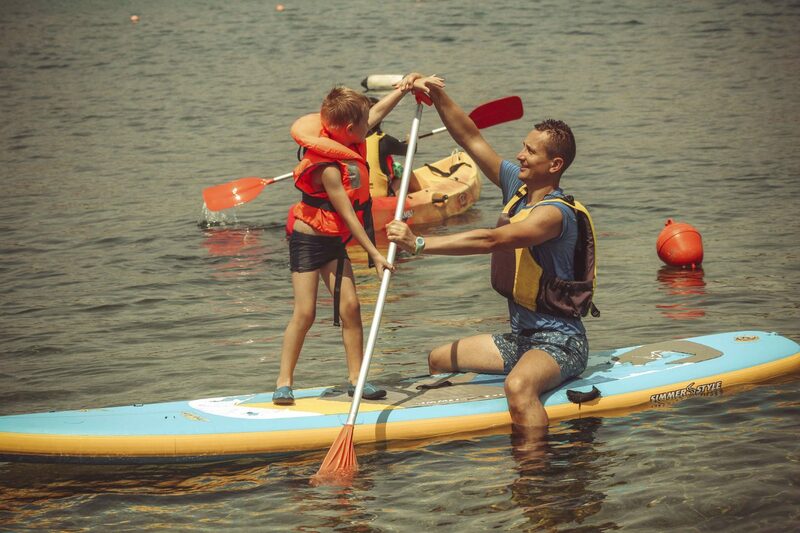 Make sure you and your child wear a properly fitted life jacket at all times while on the water. And not to forget about sunscreen, specially on summer warm days. And now you’re on your way. During your first few outings, don’t over-do your itinerary. Consider it a success that you’re simply out on the water. Save the crossing across Temper Tantrum bay until they have a few shorter journeys under their skirts. 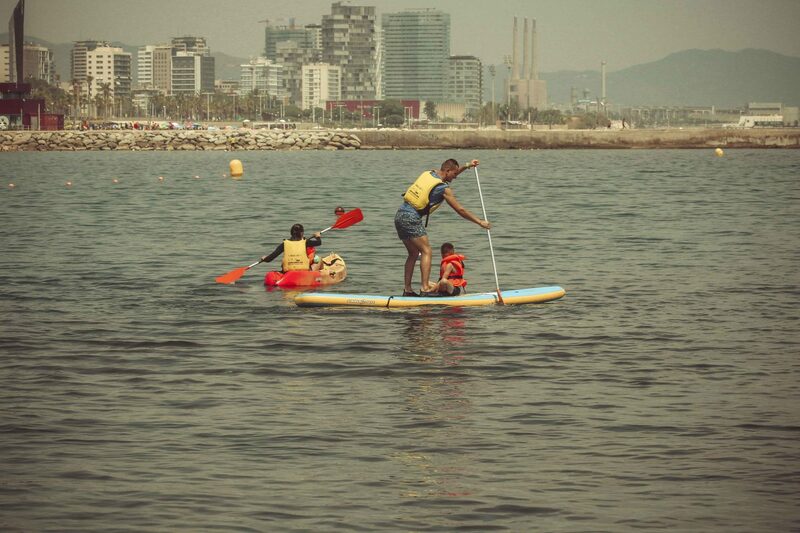 Previous Post Our windsurf experience in Barcelona. 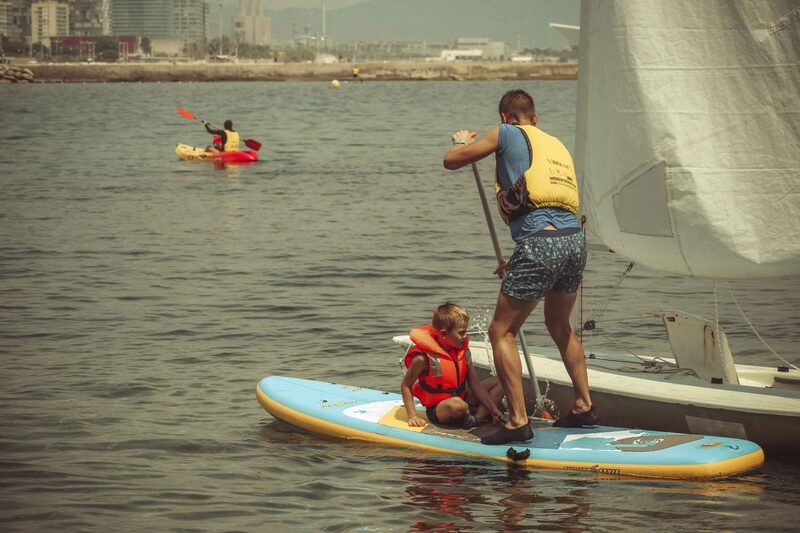 How we enjoyed our beginning windsurfing classes in Barcelona. 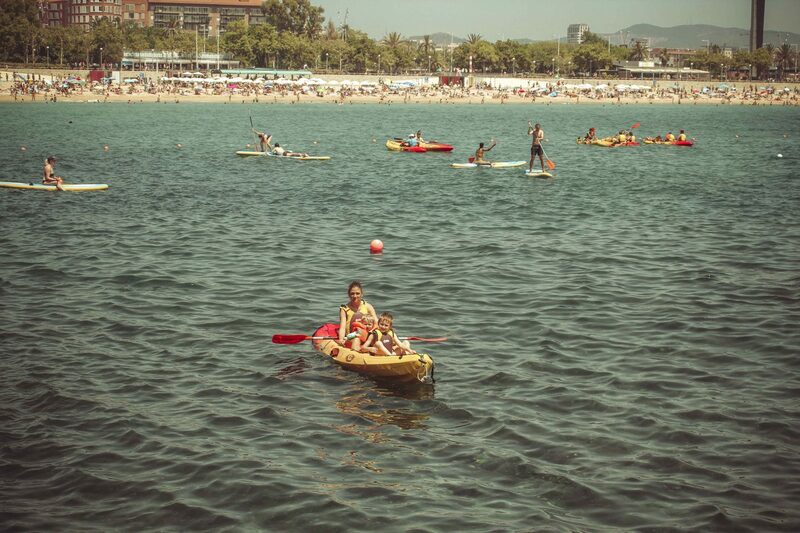 Next Post Discovering Catalunya En Miniatura with kids. Perfect getaway with kids. 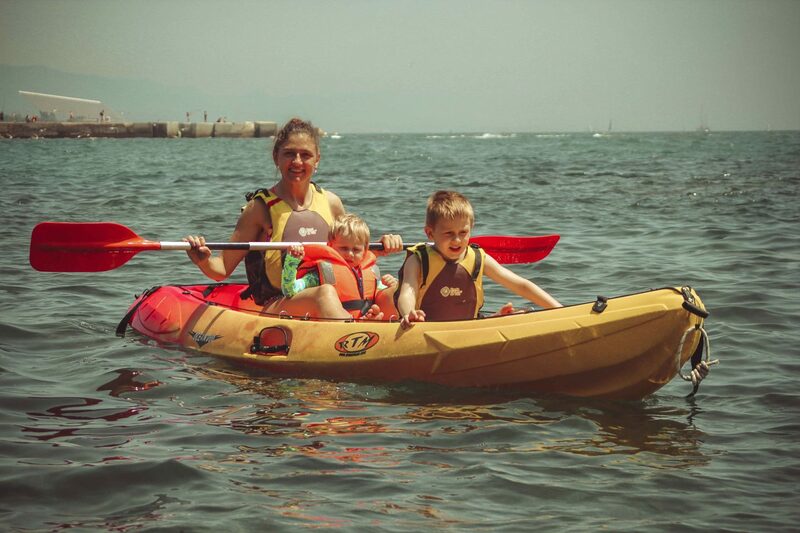 I used to kayak before I had kids!